The two day long New Delhi Ministerial Meeting on ‘Climate Change-Technology Mechanism’ began yesterday with about fifty countries participating in it. 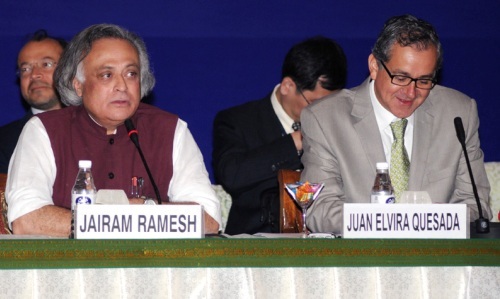 In his opening remark at the Meeting, the Indian Environment Minister Jairam Ramesh clarified that technology does not get transferred but it gets developed, shared and gets bought as a commodity or at times even gets stolen. Mr. Ramesh is of the opinion that technology and finance are two pillars in climate change issue. The Meetings focused the discussion on three main issues: Structure, Governance and Finance of Technology Mechanism. Clarifying on the need for hosting such a meeting, Mr. Ramesh said, “We are working towards an output tomorrow which will be an input in Cancun (Mexico). We will be engaged in concrete discussion as to what outcome should be worked in relation to technology matters. We have learnt from the past and will not waste too much time to discuss on issues that are very controversial on which we do not expect any agreement, either at Cancun or beyond that. We will have opportunities in future to discuss on these issues.” The United Nations Environment Programme (UNEP)’s Report on ‘Patents and Clean Energy: bridging the gap between evidence and policy’ was also circulated at the meeting. Mr. Juan Elvira Quesado, Minister of Environment and Natural Resources, Mexico, gave an over view of pre-CoP which was recently held in Mexico. He said the degree of concern of all ministers is visible here. He further clarified the purpose of the meeting as to find some way to advance in the issue of technology. He also detailed on the last ministerial meeting informing that 47 countries from the world had participated in it. He expressed confidence that this meeting will arrive at an agreement. This is the third consultation on technology in the last three years. The first consultation was held in Beijing in 2008, the second in New Delhi in 2009 and the ongoing-third consultation again in New Delhi. The meeting will conclude today, hopefully with some good points to be taken up at Cancun, Mexico later this year.